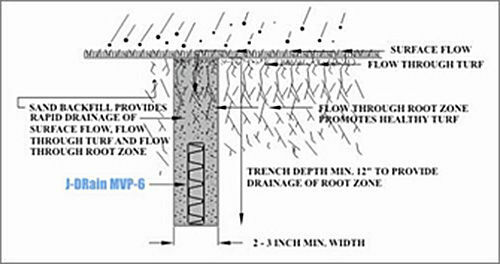 Drainage systems used to capture, intercept and channel surface and subsurface water in landscape applications are generically known as French drains, drain tile, burrito drains and trench drains. They are constructed by digging a shallow trench, lining it with filter fabric, filling it with drainage aggregate and placing a perforated pipe within the drainage aggregate to direct the water flow. Drainage composites provide a lower cost and more efficient alternative to the traditional French drain systems without the cost and expense of installing drainage aggregate and perforated pipe. 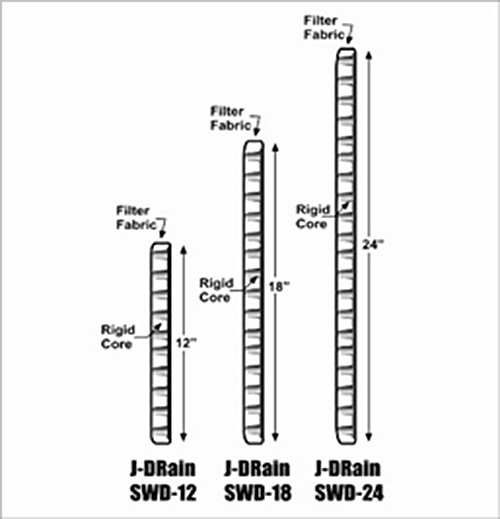 J•DRAIN drainage composites are engineered to capture water and efficiently channeling the water away in landscape applications. The three dimensional core creates a high compressive strength and high flow capacity drainage channel and the fused filter fabric prevents soil intrusion into the flow channel.